As we head towards the start of 2017 and our second anniversary, we are delighted to announce the launch of our new SaidSo Wealth Dashboard App in December 2016. As a complement to our online financial planning service, the App is a simple to use system to allow you to think about what the future could hold for you and your money. Money! What's it's all about and will it last as long as you do? 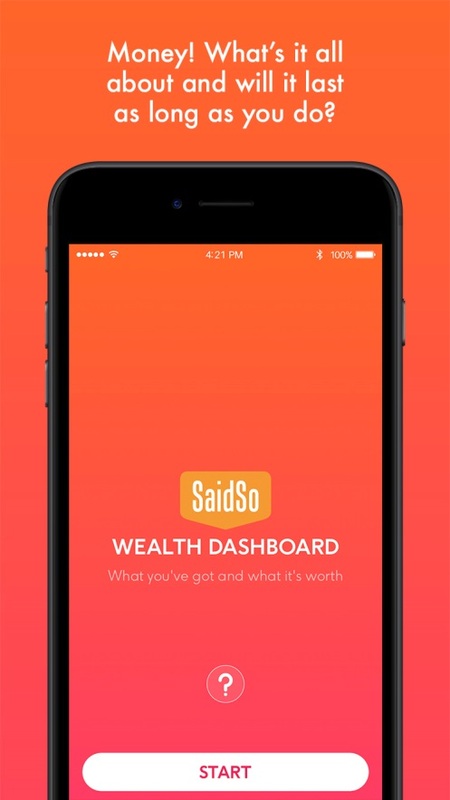 The new SaidSo.co.uk Wealth Dashboard App looks at the factors that may influence what could happen in the future. Important stuff like your age now, current wealth from all sources, how long you might live and what you plan to save. We then developed some clever calculations, taking into account reasonable and current assumptions, to give you a broad example of what cash you might have each year from the time you want to stop working. Very simple and straightforward, which is quite out of character for normal money blurb! Our new innovative App also allows you to adjust your chosen answers, such as how much you plan to save or when you want to retire, if the estimate first given doesn't meet with what you want to happen with your future money planning. Have a play to see what you could change and achieve and keep checking on the Wealth Dashboard as your circumstances change. We've added in an example State Pension benefit as well from the current age you might get it. This is not financial advice, just projections to provide broad general examples. If you're looking for full financial advice, try SaidSo.co.uk. SaidSo is a trading name of Chapters Financial Limited which is authorised and regulated by the Financial Conduct Authority, number 402899. If you want to know more about SaidSo.co.uk or our exciting and innovative new App, give us a call on 01483 330800.